One further issue to examine is the physical effect of having two different metals in a moist environment. In layman terms, this is best illustrated when you leave a metal rod outside in the shed and over time the rod will rust. Similarly, when a restoration is made out of two or more dissimilar metals, (such as in the case of amalgam fillings, porcelain-fused-to-metal crowns, and metal implants) and it comes in (constant) contact with oral fluids, there is a difference in the corrosion potential and a flow of electric current results. A “micro-battery” is formed – leading to corrosion, albeit at a very slow rate measured in years. This leads to degradation of the restoration over a long period of time. In the mouth, we call this galvanic corrosion. 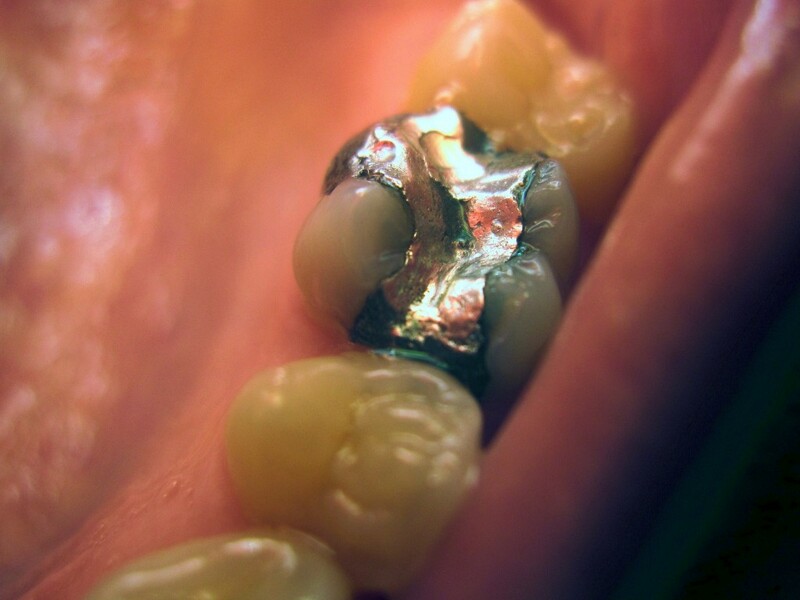 1. the breakdown of an amalgam filling or metal crown or implant leaches out metal ions over a long period of time, some of these metal ions are taken up by tissues in the body and can cause allergic responses. 2. corrosion causes microleakage of the fillings/crowns in which bacteria can seep through, causing decay at the crevices of the cavity. This can sometimes go undetected for a long period of time. 3. This “micro-battery” can sometimes cause galvanic pain in some patients as the current flowing through is many times larger than our nerve cell conduction. So where does that leave us then? What materials are our choice? The advent of composites (polymer-based) and ceramics herald in a new era where these restorations can now be “bonded” to tooth – giving strength, longevity and was more pleasing to the eye (versus metals). Of course, we now know that it is also more biocompatible with the body as it does not suffer from metal’s weakness of corrosion. It is more technique sensitive though, meaning that dentists have to spend a longer time placing composites or ceramics as compared to metal as to ensure the tooth is primed for proper bonding. However, difficulty and longer treatment time on the dentists’ behalf should not be used as an excuse to provide patients with a cheaper, and potentially health-damaging option. That is something holistic dentists strive for at the end of the day.